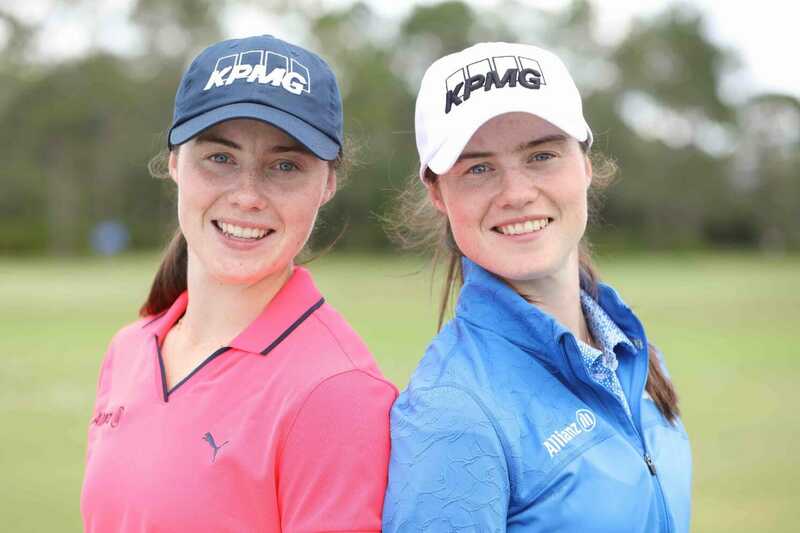 Ireland’s favourite golfing twins, Leona and Lisa Maguire, will make their eagerly awaited professional debuts at the $1.75 million ShopRite LPGA Classic in Atlantic City on Friday. The Cavan duo and former Duke University stars received sponsors’ invitations for the event as they take the plunge into the paid ranks after completing their glittering amateur careers having achieved so much already in the game. Yet with their attention now firmly focussed on the professional circuit, the pair envisage a period of transition as they settle into their new surroundings, but it’s something that they’ve been looking forward to for a very long time and the feeling is one of excitement rather than intimidation ahead of their respective bows. “It’s really exciting, it’s been a long time coming,” acknowledged the former world number one amateur, Leona. “We’ve pretty much ticked all the boxes coming up through the amateur ranks; represented Ireland many times, played Curtis Cup, and achieved pretty much everything we can. Leona was recently selected CoSIDA Academic All-District III for the second straight year, after collecting the second-lowest stroke average in Duke single season history with a 70.62 mark. A 2017 CoSIDA Academic All-American, she left Duke with a 3.943 grade-point average, while obtaining a degree in psychology along with a certificate in markets and management studies. The 2018 Duke graduate notched three victories this season, while alongside Lisa, the influential pair led the Blue Devils to a total of five team wins. So does a resume like that come with extra pressure to ensure you hit the ground running? “No I don’t think so,” continued Leona. “We always wanted to be professional golfers since we started playing. It’s always nice when you to get to live out your dreams. It’s definitely exciting, a new chapter that we’re embarking on. “But the professional game is a different animal. Of course, everything I’ve done in the amateur ranks gives me great confidence heading into professional company. But I’m not quite sure what to expect. I’d imagine that it will take a little bit of time to adjust. So often packaged as the perfect pair in the media, you soon realise why with the formidable duo so composed and grounded when it comes to thoughts of future happenings. For Lisa, she echoed her sister’s sentiments and believes that the only attitude to enter this new journey with is one of a clean slate mentality. “In a way I think the pro game is a fresh start again and we’ll have to work our way up like we always have done; start at ground zero and build,” said Lisa. “All the work we’ve done over the last number of years will definitely put us on a good standing. Indeed, neither sister is willing to let their reputations precede them with Lisa wary of managing expectation before her fledgling career hopefully takes flight. One notable thing when speaking to Lisa and Leona through the years is that both sisters tend to answer questions with “we” rather than “I” regardless of circumstance, and with that we asked Lisa if her sister’s success was ever difficult to handle when her own game wasn’t quite firing at the same level. “It’s never a nice experience when you feel like you could play better golf and it’s not quite happening,” admitted Lisa. “It’s definitely a frustrating game at times but I’m proud of the work that I’ve put in over the last number of years, especially the last four years over here at college and I think that’s why the pro game is kinda nice now. There’s a high chance that some of the places it takes them will demand that they board different planes for different tournaments at times. Leona has already earned her card for the LPGA’s second-tier circuit, the Symetra Tour, and will no doubt be looking to finish in the top-10 in the money list to earn her LPGA Tour card for next season. Lisa’s path is a little less clear but starting this week, she’ll be hoping to take advantage of as many invites as possible to ensure a full playing schedule for the year ahead. “It will take a little bit of adjustment to start off with no doubt,” said Leona of the prospect of spending some time apart from her sister. “We’ve gone off doing a lot of things together but we’ll still continue to live together and practice together as much as we can. “We’ve always said we’ve been each other’s biggest competitors and biggest friends both on and off the course and I think that’s part of the reason why we’ve achieved some of the things that we have in the game. “We’ll still try to encourage each other and compete against each other as much as possible. The pair plan to base themselves in Arizona and though no course has been announced as their adopted home as of yet, whatever club takes in Leona and Lisa Maguire will be all the better for the privilege. The golfing world sits at the feet of this prodigious duo and from everyone here at IGM, we would like to wish them every bit of success along the way, starting this Friday in Atlantic City.